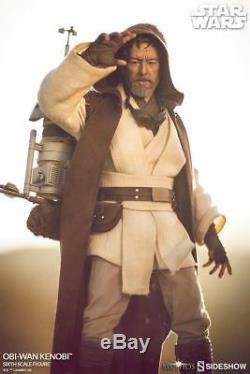 Star Wars Mythos Obi-Wan Kenobi 1:6 Scale Figure Sideshow Collectibles Unopened. Sideshow is thrilled to introduce a return to the world of the Star Wars Mythos line, with the Obi-Wan Kenobi Sixth Scale Figure. 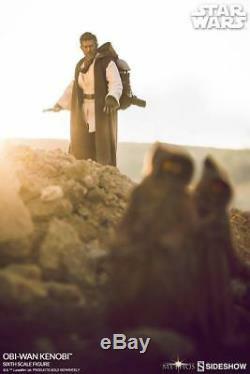 As a series, Sideshows Star Wars Mythos brings new and unique story details to popular characters from the well-loved Star Wars saga, emphasizing themes of honor, hope, and adventure to portray them in a new light. 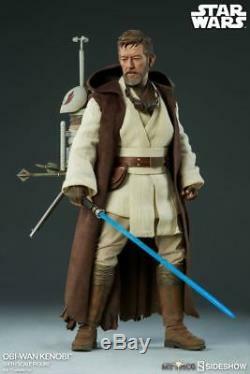 The Obi-Wan Kenobi Sixth Scale Figure captures the period in the Jedis life as envisioned prior to. 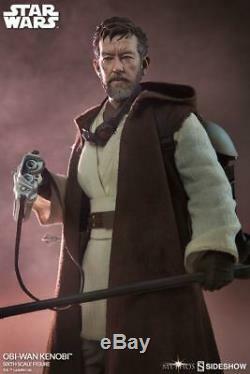 He features a detailed likeness as imagined by Sideshow artists to represent an aged Ben Kenobi who has witnessed the destruction of the Jedi Order at the hands of the Empire. 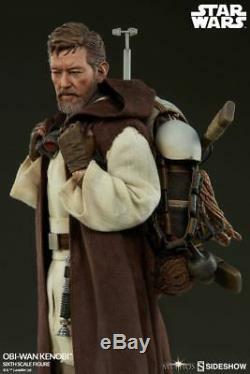 Obi-Wan comes with a unique, tailored fabric costume featuring his Jedi tunic with tabards, pants, and sash, his Jedi belt, a sleeveless robe, and a nomad pack that he carries with him across the wastes of Tatooine. The figure comes with 3 sets of hands including force hands, fists, and grip hands, as well as an additional right trigger hand for a variety of action poses. Each artifact and memento carried by Obi-Wan holds history and represents a step of his nomadic journey across Tatooine, waiting to introduce a new hope to the galaxy. 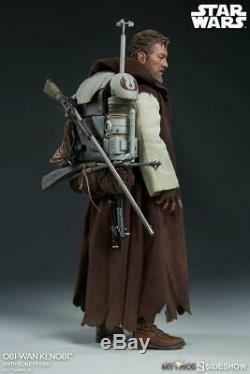 The figure features Obi-Wans lightsaber with a removable blade, as well as Qui-Gonn Jinn and Anakin Skywalkers lightsaber hilts. 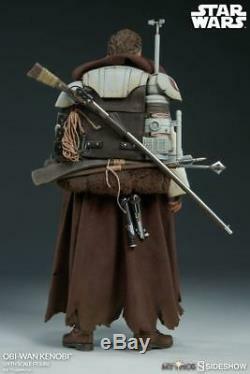 The Obi-Wan Kenobi Sixth Scale Figure comes equipped with a modified Tusken rifle and 2 gaffi sticks, and technology necessary for survival such as a portable moisture vaporator, a grappling hook, a droid caller, and macrobinoculars. 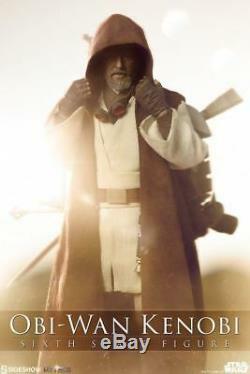 Obi-Wan also has goggles and Clone Wars armor as remnants of his noble past. 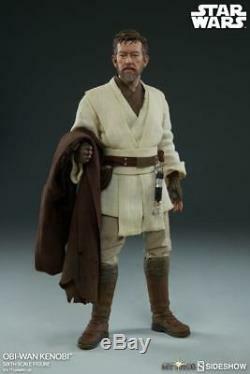 Prepare to embark on the Mythos journey with the Obi-Wan Kenobi Sixth Scale Figure, and add to your galaxy of Star Wars collectibles today. WHAT'S IN THE BOX? 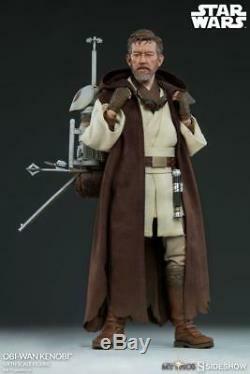 Obi-Wan Kenobi Sixth Scale Collectible Figure. 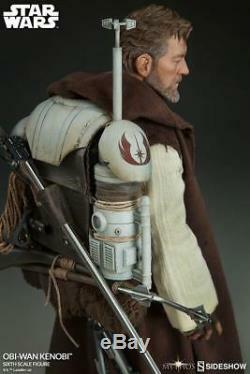 Detailed likeness of Obi-Wan Kenobi as envisioned prior to. Seven (7) hands including: - One (1) pair of Force hands - One (1) pair of fists - One (1) pair of grip hands - One (1) right trigger hand. Tunic with tabards and sash. Nomad Pack with 2 Bed Rolls and Bandoliers. One (1) pair of Jedi boots with wraps. Obi-Wan's lightsaber with removable blade. Qui-Gon Jinn's lightsaber hilt. Anakin/Luke Skywalker's lightsaber hilt. Goggles (cannot be worn by figure). Clone wars armor (cannot be worn by figure). We understand you because we're collectors too! That's why you get. Free double boxing on all standard size 1/6 scale figures. They're truly an amazing place! Been a custsomer for over 5 years. Wish this place was literally next door because I would live there. Listing and template services provided by inkFrog. 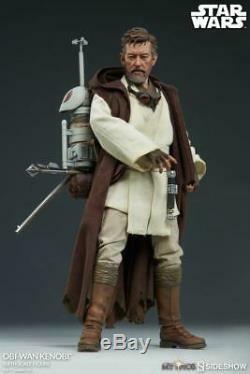 The item "Star Wars Mythos Obi-Wan Kenobi 16 Scale Figure Sideshow Collectibles Unopened" is in sale since Wednesday, December 5, 2018. This item is in the category "Toys & Hobbies\Action Figures\TV, Movie & Video Games". The seller is "alteregocomics" and is located in Lima, Ohio.